Now see how you are, all that cheap food has destroyed your pallet! You had better quit eating all that cereal and drinking all that star bucks coffee, not to mention the milky ways.You need to clean your pallet so you will be able to eat the best and really enjoy it. 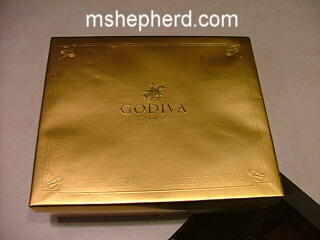 That is if Godiva has not cheapened their candy. 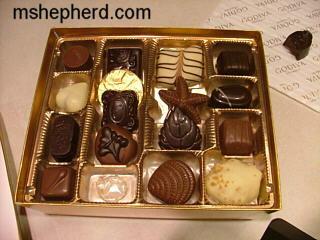 Will let you know when we sample our box, that your sister gave to us. Your late twenties??????????? You mean swiftly approaching forty! Actually, your birthday will be July 25th and you’ll be 38 years old. 38 is NOT in your late twenties! Just a friendly reality check OLD MAN! By the way, I’ll say I’m older then dirt befor you can and take all the fun out of it for you! HA! Curse you Phyllis!! I had them all fooled! My own Mother even let it slide, and you had to come along and ruin it all!! I’ll get even for this! To quote the Beatles, “Yeah.yeah,yeah! You think you fool me? Well you are so wrong! You say in your upper 20’s and I know you are in the upper 30’s so you better gut it up. You and Wendy could pass for late 20’s – I say Go with it! Haha! I noticed it right away. He just wanted to see how many of you he could fool. Slippery, isn’t he?! Yes, Barb. I have gotten carded many times and many people have told me I don’t look like I am in my 30’s. Hey Mikie! AARP called today and they said that they will welcome your membership in a short 12 years! Well Wendy, as we know, you are actually only 9 years old, so it is no wonder that you have been carded many times. 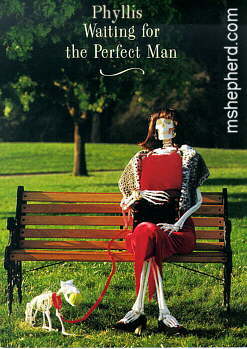 Phyllis… I forgot to send this pix I snapped of you in the park during your last visit! Funny Mikie. You used the same picture for a joke about Jenn a year ago. By the way, wasn’t Wendy born on February 29th making her a leap year baby and thus only 9 while you (July 25th) were not so lucky and are 38? Poor old man! The memory is going fast! Try writing these things down! Any way you slice it, I was born BEFORE Wendy. Makes me younger!